Recently preparing for Renegade in Chicago, I realized the enormous number of details involved in getting ready for a craft fair. Not only do you have to have all of your merchandise ready, you also have to gather up a myriad of items to take with you. There is so much to remember and it can be so time consuming that I've tried to organize the process in a way that makes it quick (or quicker!) and easy (or easier!) to grab everything and run out the door. Every minute you spend gathering supplies is a minute you could be using for creating or marketing. And if you make it easy and foul-proof enough you may even be able to delegate this part to a boyfriend, roommate or Mom who has offered to help. This will give you time to make one last thing! I'm an advocate of the list. Maybe because I can't seem to keep track of anything without them, I usually have several things-to-do lists going at once. The list translates well when I'm trying to keep track of everything I need to take with me to a show. I make copies of the list, keep the blank copies on hand in a notebook and literally check items off as I pack them up. This is especially useful during this time of year when there are many shows back to back. Knowing what to take with you can be tricky at first but you'll get the hang of it. A lot of it is just general supplies, some of it relates to your comfort, and some relates to the elements. I recommend using a tool box. 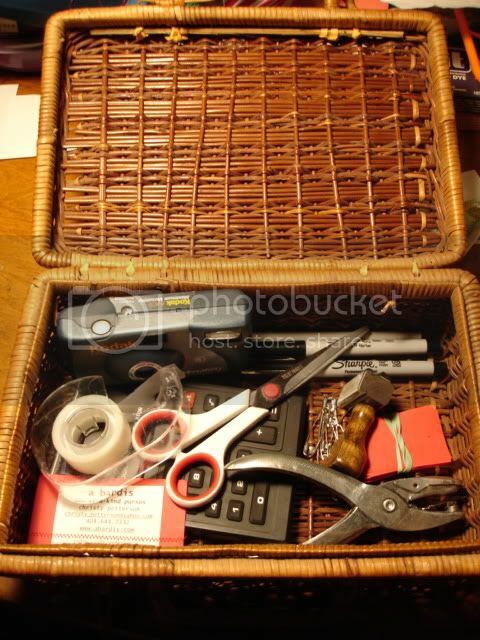 This can literally be a tool box from the hardware store, a shoebox or anything fun that can hold supplies. Choose whatever works well for you and is small enough to carry easily without adding to the load and large enough to hold everything you need. Buy seconds of everything so that the tool box is always packed and you never have to raid it when you are at home looking for scissors. Things I include in the tool box: calculator, pens, sharpies, tape, safety pins, scissors, and twine. Twine has proven to be a life saver on several occasions. You never know what you'll need it for, but chances are you'll need it! As you develop your set up and display you'll know what else you need to have on hand. S hooks have recently been added to our tool box because of a new way the I.C.E. Collective is displaying clothes. The tool box contents will evolve over time. After your tool box is ready, there's the big bulk. If the show's outside you'll want a standard 10 x 10 tent. If you don't have one though, don't let this stop you from participating. Just cross your fingers that it doesn't rain and make sure you wear sunscreen if it is summer. 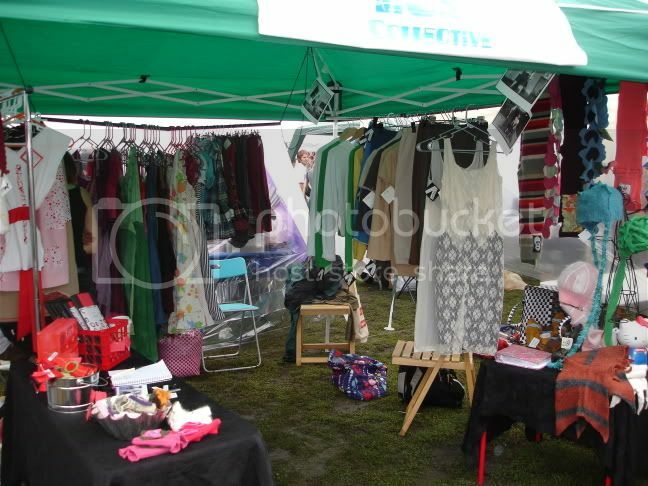 You'll also need tables, chairs, clothing racks (if you make clothes) and anything else you use for display purposes. Sometimes tables and chairs are provided for indoor shows. Find out what you are responsible for. So now you have your tool box, big bulk and your merchandise. Here are a few more details you might not have thought of. Bring a table clothe and anything you can think of to make your display aesthetically pleasing. Bring water and a snack. You're going to be there for awhile so make sure you aren't stuck at your booth parched and starving. Wear layers. If the event is outdoors it may be cool in the morning and warm up by afternoon. You don't want to be stuck wearing a big sweater and sweating! If the event is indoors you never know when the a/c is going to blow you away. Bring something to keep busy. Sometimes there are slow spells and you want a magazine to flip through or you may even be able to craft while you are sitting there. Bring a camera to snap a few shots of your items, your set up and the event itself. Bring cash that you can use to make change for people when they make a purchase. Keep the money near you at all times. Don't be naïve, theft happens. Bring business cards and a blank notebook for people to sign up for your mailing list. Shows are not just about sales. They are also about exposure, meeting other crafters and networking. And you never know when a shop owner or a reporter is going to show up! Another way to be prepared is to make sure you are ready. Try to get a good night sleep-I know, you want to stay up all night making more stuff but you'll feel so much better if you aren't tired. Make sure you eat breakfast and drink your morning coffee. And be excited and enthusiastic and friendly. People will enjoy walking into your booth if they see you are really enjoying the event. Greet everyone with a smile and a "how are you?" I like to find one item they are wearing and compliment them on it. It is a good ice breaker and makes them feel like we have a similar style. But I never compliment anything that I don't like. People can pick up on insincerity. Last be mentally prepared for anything especially if the event is outdoors. The weather can really make things complicated and you have to be prepared to get through it without letting your attitude suffer. I've survived freezing cold, extreme wind and rain...not all at once though! If weather gets bad, keep your head level. You may have to change your set up according to the weather and you want to be able to make a quick decision on what to do. If you start to feel frazzled give yourself a moment. Just stop and relax and try to figure out the best solution. Look around at the other participants-what are they doing to keep rain out of their tent or to keep their tent from flying away? Do the best you can at fixing the problem. And then just remember-crafting is fun! You're out on a rainy day because you're proud of what you've made, and make up your mind to have fun even if you get a little wet. Alright, you are all set. You've got your merchandise, your tool box, your big bulk and your impeccable attitude! Now go out there and sell!!!! This list will help you get started-tweak it as you need to. Christy Petterson lives in Atlanta where she writes, sews, works in PR, organizes crafty events, roadies for her drummer-of-a-husband, eats the yummy food he cooks her, drinks coffee, goes for walks and occassionally watches dumb tv and sleeps. I also bring along a list that I print up on my computer of all of the shows I will be at in the near future....people always ask questions about where you are going to be next weekend etc. That is great! You make craft shows sound like so much fun, despite the hard work involved. If I only had enough merch to sell at one I would be so inspired to get out there by this article! But I suppose it probably depends on the atmosphere of the whole show. groovyglassgirl, that is a great idea! DJules, I totally agree about the reading thing. You wouldn't want to sit and read a book, but I think flipping through a magazine is different because you can totally pay attention to people coming! It is important to seem interested and involved. I've got about 5 fairs to do before the end of the year and i'm slowly getting better at organising myself- but it's good to have someone else write the list for me! perhaps i'll do a little cut & paste into word, my lists are always scrawled onto old receipts and scraps, never really doing the trick.